Selling is complicated and a structured process is required to support successful sales operations. Before we can make the sale, we need lead generation. Lead Generation is something of a science in itself. Creating the compulsion for people to pick up the phone or fill in a web form starts with the prospect having a specific need. But it’s also about demonstrating that you are able to meet that need better than your competitors. Once we have these precious leads we need to distribute them, and fast. Whether you are in the in the business of selling leads or capturing them, you need to make sure that you are able to observe the 3 Rights of Lead Generation – Right Lead, Right People and Right Time. How do you know when a lead is right? Well, you have to score the lead. Scoring the lead against criteria determines how hot it is. Grading the leads like this enables you to get the best leads to your best salespeople. Getting grading right through correct scoring is important. Your salespeople may identify a bad lead source if lead conversion rates are not in line with what is expected because scoring is inaccurate. A bad lead provider can do a lot of damage to the moral of the sales team. Once the sales team knows that leads are not up to par their moral dips and your sales efforts follow. You cannot afford to not closely monitor the performance of your lead providers. You should be looking for contact rate and the rate of the next critical step. What is the critical step? This depends on your business but could be the total percentage of leads contacted that turn into appointments, qualifications, credit pulled, or any step that is critical to closing a deal. Each of these basic metrics matter. If your bad lead rate goes up, everything else will follow. A bad lead could be someone who shows no intent of purchasing, that never applied, or even was even procured in a fraudulent way. Who does the lead need to be pushed to and what’s the best method for pushing it? Or you can send the lead to a shark tank or shotgun method where your salespeople can compete for the lead. The scored and graded leads need to be pushed to the appropriate queues, teams, branches, users. If it’s across your own sales team, make sure the lead goes to the most appropriate sales people, with the right product or service knowledge or the right closing skills. As an example the mortgage industry has very specific licensing constraints and your lead generation program must cater to this. You wouldn’t procure leads for Virginia when you have no licensing coverage in that state. Sometimes the Right People just need to receive leads by email. Other times though you might want to push them to a lead management system. Sometimes you might want to push them straight into an auto-dialer enabled sales lead management system so that the next available agent gets to follow up immediately. What’s the right time to deliver leads to either your own salespeople or franchises? Fast response is the name of the game, because research shows the first to respond has the best chance of winning the deal. 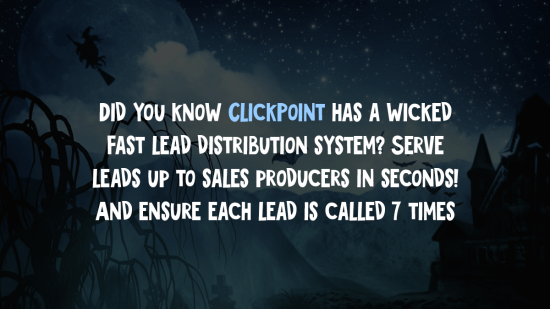 More often than not, the right time to distribute leads is as soon as possible. This is why investing in a system that can get your leads from your lead generation programs to your salespeople in seconds is so important. You can deploy shotgun, shark tank, or push, but be sure you have the appropriate team members to handle the leads from your efforts. Many times we see most sales teams are not aligned with marketing. Marketing has a specific job, to create leads. The sales team has to be able to take what the marketing gives and turn them into closed deals. What happens if the sales team is not communicating with marketing? I can tell you, it isn’t pretty. This entry was posted in Sales Software Best Practices on October 28, 2015 by Gabriel Buck.